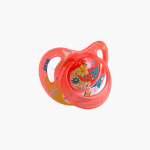 Nuby Ortho Pacifier with Cover | Red | Massage and stimulate your baby's gums. Soothe and relax your adorable angel as you get this pacifier for massaging the gums. Featuring an eye-catching make, the piece is apt to stimulate the gums too and keep your kid calm.